This Chicken Satay is easy to make and has tons of flavor. Boneless, skinless chicken thighs are marinated in green curry paste, soy sauce, lime, honey, and more, and grilled until caramelized and delicious. It’s finished with a simple peanut sauce for dipping! I should comment right off the bat about how this Chicken Satay isn’t skewered, but aside from that, these are all the flavors that you’d expect from Chicken Satay. Why don’t I skewer the chicken? Honestly, because I find it to be too tedious and time-consuming, and not really necessary to get the enjoyment I want from the dish, which is primarily the flavors. 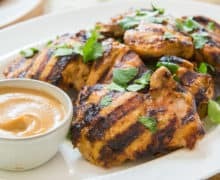 Boneless, skinless chicken thighs are relatively thin, easy to grill, and can be sliced and dipped into peanut sauce just the same. Is it as fun as dipping a skewer into peanut sauce? Maybe not, but not having to thread chicken for 15 minutes is also my idea of fun. Because we don’t spend time skewering chicken, this recipe is really quick to prep. Just whisk together a few marinade ingredients, add the chicken to marinade for a couple hours, then grill the chicken. And you can make the peanut sauce while the chicken is cooking. It’s a breeze! If you need a flavorful Asian chicken dish that doesn’t require any marinade time, these Korean Chicken Bowls truly take 15 minutes to make, and are one of my other go-tos. Beef and Broccoli and Cold Asian Noodles are also really fast. If you want to make it gluten-free, just swap in Tamari for the soy sauce. 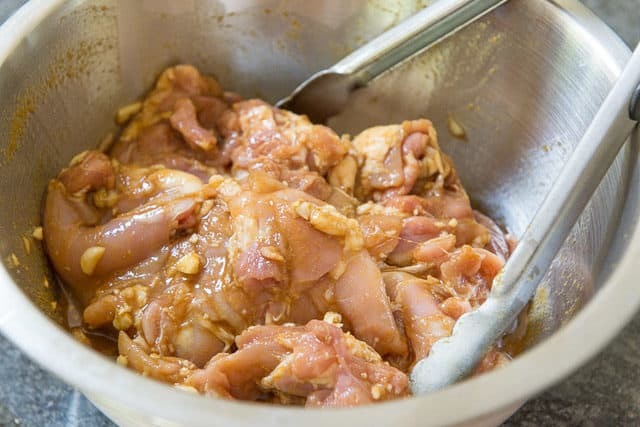 Marinate the chicken between 2-4 hours. You can do up to overnight if you want to prep it the day before. Grill the chicken thighs until caramelized on the outside and cooked through. 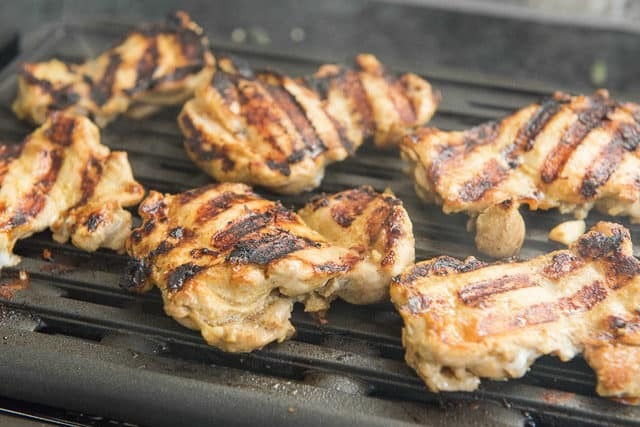 For a grill on medium high heat, it should take about 3-4 minutes on each side, depending on the thickness of the chicken thighs. 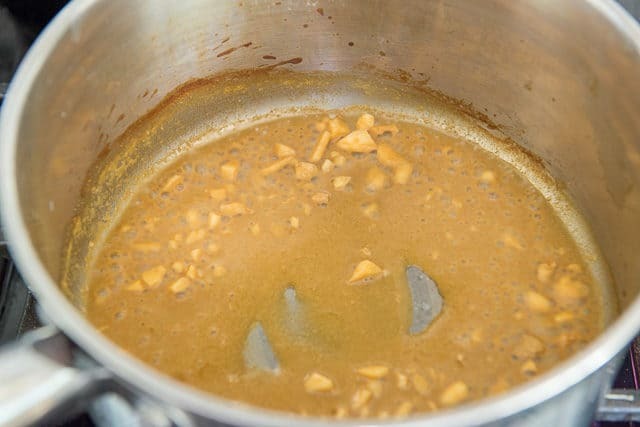 While the chicken is cooking, you can make the peanut sauce. Because there’s already curry paste, garlic, soy sauce, and more, you only need to add minimal ingredients to it. I prefer to use a smooth peanut butter here. That’s it! The peanut sauce is ready to be served alongside the chicken. Leftovers will keep in the fridge for 5 days, and you can freeze the chicken if you want to keep it longer, for up to 2 months. I don’t recommend freezing the sauce though unless you’re okay with the texture changing (it will break and clump). To reheat the chicken satay, either warm it in the microwave or re-warm in a 300F oven for about 10 minutes. Enjoy! 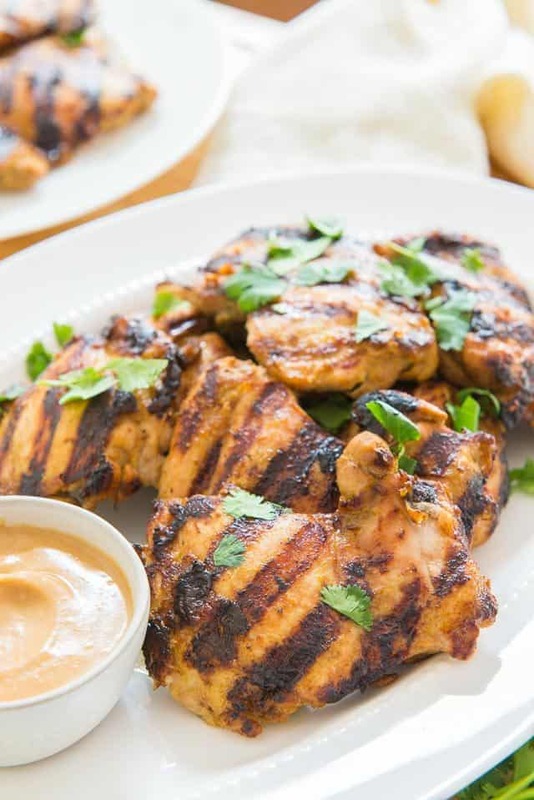 Boneless, skinless chicken thighs are marinated in a flavorful mixture of curry paste, soy sauce, lime, honey, spices, and more, and grilled until caramelized and delicious. Serve with a homemade peanut sauce for dipping! 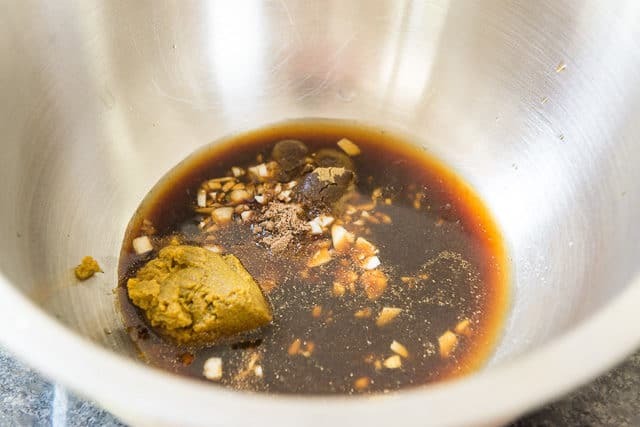 In a large bowl, whisk to combine the soy sauce, lime juice, green curry paste, garlic, fish sauce, cumin, coriander, and honey. Add the chicken to the marinade, toss to coat, then let it sit in the fridge for 2-4 hours, and up to overnight. 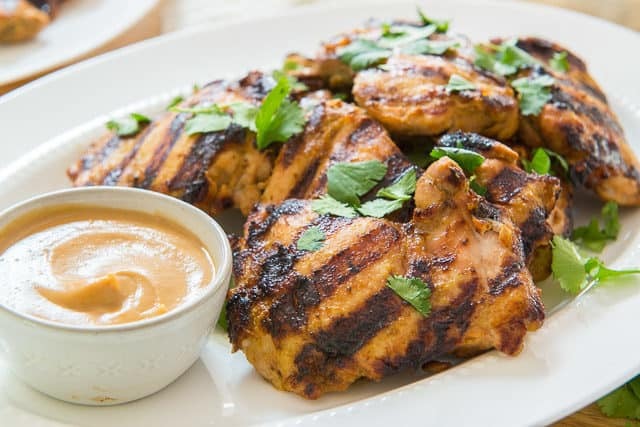 Preheat a grill** to medium high heat, and take the chicken out of the marinade (don’t discard the marinade). Grill the chicken for about 3-4 minutes on each side, until cooked through. While the chicken cooks, pour the leftover marinade into a saucepan, and bring the liquid to a boil. 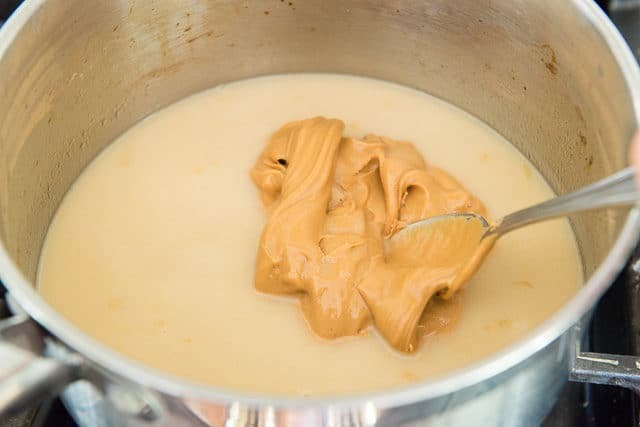 Boil for a minute or two to ensure that the bacteria is killed, then add the peanut butter and coconut milk. Bring to a simmer and cook for 3 minutes. Remove from the heat, and whisk in the lime juice and honey. Taste it and adjust the seasoning with salt and pepper if necessary (and you can also add soy sauce). Serve the chicken satay and peanut sauce together. Enjoy! *Try to use a coconut milk that has a stabilizer in it. For example, the Trader Joe's one doesn't have any stabilizers, so it will tend to separate unless you stir it vigorously. ** If you have an outdoor grill, that's fantastic, but most of the year I grill indoors with this plug-in grill. My father in law got it for me for Christmas one year, and I was shocked by how much flavor and caramelization it gives. Highly recommend! This post was originally published in June 2011, and updated with new photos and writing in May 2018. This sounds so delicious! 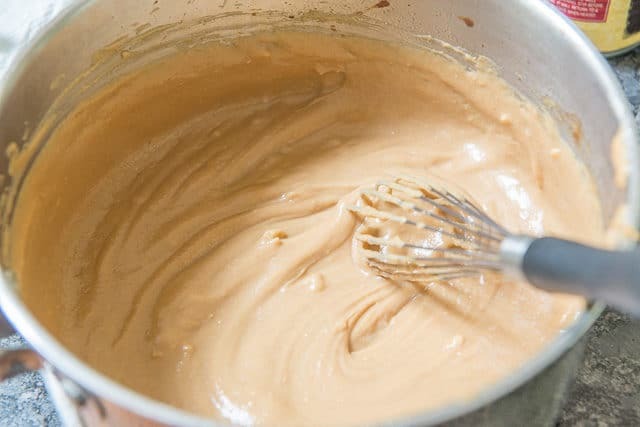 I have a huge love of all things peanut butter, but I’ve actually never tried peanut sauce. This recipe definitely makes me want to give it a try very soon! This is one of my all-time favorites and yet, I have never made it myself. Always been served it or ordered it out. Good to find a recipe that will change that! Did you trim your chicken from the bone?? Hi Jenn, I bought my chicken from Publix and it was already off the bone when I got it. I love Thai food as well. In fact last night for dinner I made Thai Curry Noodles with Broccoli and Tofu it was a recipe from Vegetarian Times. Can’t wait to try your Chicken Satay with Peanut Sauce. Growing up my Mom was a good cook but she only cooked American dishes. You can bet back in the day that we had meat, potatoes, vegetables and yes a dessert at almost every meal. I enjoy cooking and eating foods from around he world. Do you have any special recipes for Chinese New Year in February? I’ll keep checking your site. My daughter is allergic to coconut. What can I sub for the coconut milk? Hi Kristin, you can just thin with water instead of coconut milk.